Total: 1 hr 5 Min. | Active: 40 Min. Heat the oil in a wide-bottomed pan and sauté the shallots. Add the mushrooms, cherry tomatoes and pepper, cook for a further 3 mins. over a high heat. Pour in the white wine, add ¾ of the parsley along with the rosemary and olives, season, simmer over a medium heat for approx. 5 mins. Transfer to a bowl, set aside. Remove any bones from the fish fillets with tweezers. Mix the thyme, curry, salt and pepper, and use to season the fish. Fold the sheets of baking paper lengthwise and open them again. On one half of each sheet, brush a little butter in the centre. 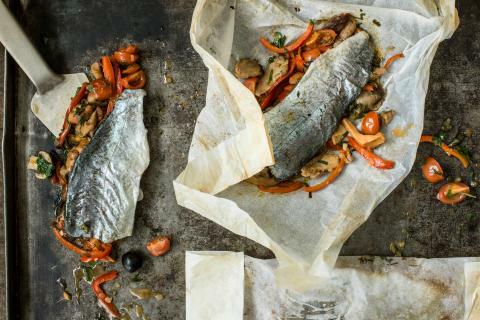 Sprinkle with the remaining chopped parsley, spoon the tomato & mushroom sauce over the top, place the trout fillets on top with the skin side up. Brush the edges of the baking paper (approx. 1 cm wide) with egg white, fold the other half of the sheet over the filling, press down gently. Lightly brush the three outer edges with egg white once again, fold inwards and press together, repeat this step to ensure the parcels are well sealed. This means that the steam cannot escape and the fish will take on the aroma of the other ingredients. Bake for 20-25 mins. in the centre of an oven preheated to 180°C. Cut open the parcels and serve the contents – fish, vegetables and cooking juices – on plates.